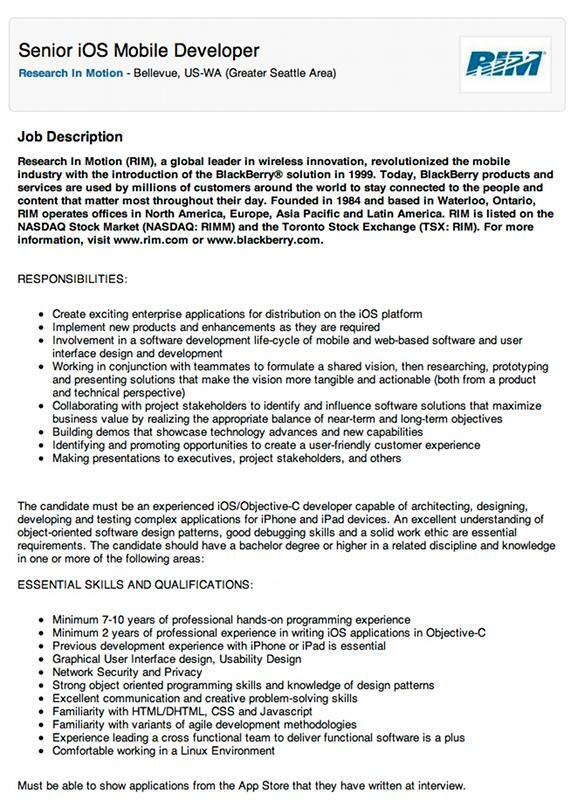 A job listing that appeared on Research in Motion's website reveals that the BlackBerry maker is looking to hire developers for an undisclosed iOS enterprise app to be distributed through Apple's App Store. Upadte: A RIM spokesperson confirmed to All Things D that the company is indeed developing an iPhone app as part of its BlackBerry Mobile Fusion project. In order for BlackBerry Mobile Fusion to perform advanced management functions for iOS devices, RIM will develop an on device client to be included as part of the overall solution, the spokesperson said. The listing, which was posted on Tuesday only to be removed by Thursday, described a long-term position that would be in charge of creating "exciting applications for distribution on the iOS platform" to be implemented into new products. Along with the usual coding and communication skills, requirements called for a candidate well-versed in creating apps for both the iPhone and the iPad. While the exact responsibilities of the job are vague, the position could be related to the company's Mobile Fusion security software that was introduced in 2011. The software, which is intended to run on both iOS and Android devices, is aimed at corporate customers and extends device management beyond the company's own BlackBerry products. Once the market leader in smartphone push services and enterprise products, RIM has fallen to the wayside as popular offerings running iOS and Android have eclipsed BlackBerry sales. In a recent report, it was estimated that the Canadian company was worth less as a whole than Apple's App Store alone. In May 2011, RIM announced that it would be update its BlackBerry Enterprise Server to support iOS devices, signaling a possible strategic shift toward data services instead of hardware. Service outages, poor product launches and a series of software update delays brought down RIM's market share, and the company is struggling to survive in a world dominated by the iPhone and similar Android handsets. Screenshot of RIM's job posting for an iOS developer grabbed by All Things D before its removal. It was revealed on Thursday that Apple outsold BlackBerry devices for the first time in RIM's home country of Canada.